Olivia Abbott is a cheerleader – pretty clothes, pretty hair and pretty perfect. Ivy Vega is definitely not the cheerleading type – black clothes, black eyeliner, pale skin. They’re as different as day and night… except that they’re twins! When the long-lost sisters meet for the first time, Olivia discovers that Ivy has some skeletons in her closet. But that won’t stop them from getting to know each other’s worlds. After all, blood is thicker than water – and much tastier too! A killer story of schools, sisters and secrets. Get ready to sink your teeth in! I loved this book how they found each other and her dad the vampire married a human but the vampires aren’t allowed to marry humans. So they have foster mums and dads. These two very different girls are twins. it is like liqurice and candyfloss. I only just finished this book and thought it sucked (as the goths say;))It was so good I got my mum to buy the next 7 in the series. for any of you who didn’t read this book, here one of the Devil’s cheers: Ashs, Ashs, Dust to Dust. Hate to beat you, but we must. When your up, your up.When your down, your down. when you’re messing with the Devil’s, you’re up(clap,clap) side(clap,clap)down! (clap,clap)it will rock your mind off!!!!!!!!!! anyway, if u want to talk to me, rate this book and i will text you back,i hope. It will rule your school!!! by ur queen LOL. cheers!!!!!!!!!!! ( Get it?) Wink,wink!!!!! i loved this book because it has such an interesting story line, the two main characters are great, and it’s just fantastic. Sweet I loved it. Maybe cause I luv vamps and mysteries. I am currently reading this and i am just over halfway though. I have got that far in less then a day as i started it late yesterday afteroon and now it is early afternoon. This book is easy read and really enjoyable. Love it-Can’t wait to read the next in the series! This book is AMAZING. All i have to say! 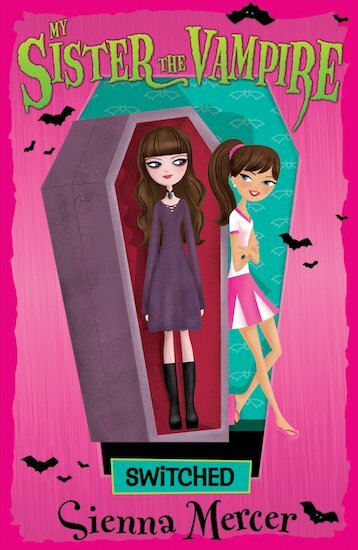 The book My siter the Vampire;Switched is Vangtatic! this book is the best book ever soooo good my faviourte character is ivy she,s so cooooooooollll. The first one in the series!! It was great !!!!! Every one read it !! #My Review: One of the cutest books I have read in a while. The story about two sisters finally meets when they are thirteen but one of them is a goth who turns out to be a vampire; both girls switch places to get to know each other’s life and in the same time each one of them fix or touches something with the other girl’s life is for sure an enjoyable idea to read because it’s so light book and you get to love the Gothic gang, love Ivy’s father’s house, learn the new facts about vampires which means they age slowly and finally think of the mystery at the end of the book. How come Olivia is a human and Ivy is a vampire while you must be born as a vampire? this book was FAB I’m not normaly the type of person to read any book with the word “Vampire” in the tile but now more than ever I’m wanting to buy the next one the series ! OMG ! so interesting books! ma fav book! I recommend this book because it makes you feel like you are really in it! It is exciting in many ways and I think you will see that too! The two girls are different in every way more than you could imagine! This book is one of the best books I have read, it is really cool how they’re twins and one of them is a vampire and the other a cheerleader!